One of the ways that we’re able to keep our costs down is by selling direct to our customers. We don’t have to worry about the costly markup of distributors or big box stores. This allows us to craft some of the highest quality kitchen cabinets on the market, but still offer them at affordable prices because we don’t have the overhead of a large distributor network who is forcing us to drive our prices up. In addition, we’re located right here in Ramsey, MN which means we’re always available should any problem arise with your cabinets in the future. We’ve been here for generations and we’ll continue to be here for years to come. 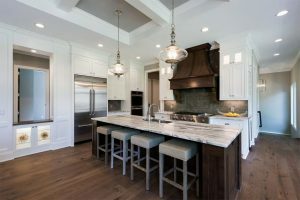 The reality is that it’s almost impossible to provide a baseline cost for custom kitchen cabinetry, because at Danner’s Cabinet Shop, no two kitchen renovation jobs are the same. We sit down with each of our customers to list out all their wants and needs and then work back from there based on their budget. Because of our ability to manufacture all of our own cabinets, we’re able to source a variety of different cabinet materials, some of which are much more budget friendly than others. This way we can still create your dream custom kitchen, but at a price that’s more realistic based on your budget. At Danner’s Cabinet Shop, we’re here to tell you that your dream of a custom kitchen that meets each and every one of your needs is very possible. Feel free to reach out to our team today to schedule a time to come into our kitchen cabinet showroom to look at some of our work to see just how talented our cabinetmakers are when it comes to crafting high quality cabinetry. We can be reached by phone at 763-753-4002 or you can reach out to our owner via email at troy@dannerscabinets.com. We look forward to setting up a time to discuss your custom kitchen cabinetry needs very soon.